These South African succulents grow in clumps of stemless, star-shaped rosettes in its dry, rocky native habitat. Give them the same hot, dry, sunny environment and they'll feel right at home. In fall, yellow, daisy-like flowers may appear on plants that are a few years old. 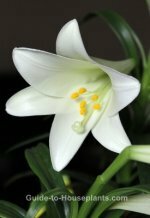 However, they won't bloom without 3-4 hours of direct sun each day during the summer. Moving your plant outdoors for the summer will give it the light these succulents need. Tiger's Jaw prefers slightly cooler temperatures in the winter, but this succulent is not cold-hardy. If you move it outdoors for the summer, be sure to bring it back indoors when nighttime temperatures drop below 60°F/16°C. 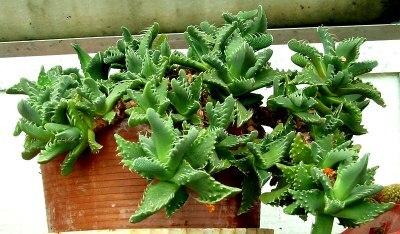 Give Faucaria tigrina a rest in winter. Cut back on water, stop fertilizing, and provide average room temperatures and full sunlight -- a sunny window is ideal. In spring, resume normal care. Repot every 2-3 years, or when they outgrow their containers. Succulents have small roots, so you can grow them in shallow containers. Be sure the pots have drainage holes to prevent root rot. Water: Keep soil lightly moist spring through fall. In winter, allow soil to dry out between waterings. Temperature: Warmer spring through fall 70-90°F/21-32°C. Average temperatures in winter, 60-75°F/16-24°C. Soil: Cactus potting mix . Or, use 2 parts potting mix with 1 part sand. Fertilizer: Feed every 2 weeks spring through fall with a 2-7-7 liquid fertilizer diluted by half. Do not feed in winter. Propagation: Offsets will grow at the base of the parent plant. Cut them away with a sharp knife. Allow the cut surface to dry for a day so it doesn't ooze sap and to prevent the new plant from rotting. Plant the offsets in a lightly moist, sandy potting mixture. Keep new offsets in a warm, bright place, but out of direct sun for the first month. The best time to propagate is late spring to early summer, when succulents are beginning their most active period of growth.